Work started on the West Hill Lift in Hastings in January 1889 and was completed in March 1891. It cost £16,000 in total: a large sum in contemporary England. The lift was powered by a gas engine, with steel ropes attached to the passenger cars to keep them stable at all times. Automatic speed controls and brakes were included as safety measure. 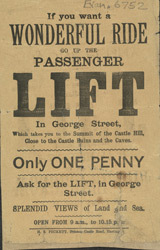 The lift operates to this day, taking people to the caves and other tourist attractions at the top of the cliff.